Too bad my big league dreams ended on a college baseball field. I’m not complaining. Playing baseball helped pay my way through college and led me to the broadcasting career I enjoy so much now. But, I had one of those, “I wish I knew that then…” moments Sunday after a fascinating conversation with Dale Sveum about the art of hitting. 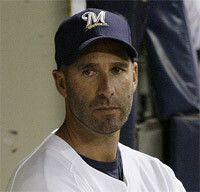 As the Brewers hitting coach, Sveum’s job is to unlock the many doors to hitting success. Needless to say, he carries a full set of keys. In the simplest of terms, he unlocked a big door for me. Too bad it was 20 years too late! Sveum broke down hitting into three parts. The first two, the most important, depend on the eyes and the brain: One, finding and focusing on the ball out of the pitchers hand and two, making a decision to swing or not. The third is the most physical of the three, the actual swing, putting the barrel of the bat down the eye line to the baseball with hands, hips, legs, feet, etc…all at work together. The reason hitting a baseball is the hardest thing to do in sports is because all three have to be applied in HALF a second. My “a-ha” moment was when I realized that most of the baseball world spends most of their practice time on the third and final step, swing mechanics. Google “hitting instruction” and you’ll find hundreds of philosophies and “gurus” on the proper swing. Truth is, there is no single “correct” way to swing a bat. There are basic fundamentals that have to be in place to hit a baseball but the heart of successful hitting is pitch recognition. It is THE most important aspect and THE least often practiced skill in amateur baseball. In your baseball playing life, how often have you asked or been asked to “track” pitches? No swings. Just stand there with a bat and find the baseball out of the pitchers hand then make a decision whether it is a hittable pitch before it hits the catcher’s mitt? It is so easy in hindsight. It is so hard in real time. I played baseball from the age of five through college and NEVER spent any great amount of time tracking pitches and improving my pitch selection ability. On the flip side, I spent countless hours working on swing mechanics. Drills after drills, batting practice, tee work, soft toss, video, etc…all the while neglecting the very thing a pitcher is trying to do to me as a hitter, trick me with pitch selection. I’m not saying pitch selection wasn’t discussed all those years, just that improving the specific SKILL of pitch selection was never made clear until my conversation with Dale Sveum. Defining the skill offers the opportunity to improve the craft. Your eyes need just as much practice as your below-the-neck activity. Your brain needs to be pushed, worked out, practiced, rested, and TRUSTED (some call that confidence) so the physical part of hitting can actually be applied. So baseball coaches, I’m encouraging you to make time for your hitters to stand still. Stand still and practice seeing and thinking! Stand and track pitches. Get a good understanding of the strike zone. Implement eye training techniques like fighter pilots do. Make up your own games on vision and decision making. If you’re still an active baseball player, take my advice and work on these skills. Make it important before it’s too late. A (hitter’s) mind…is a terrible thing to waste!